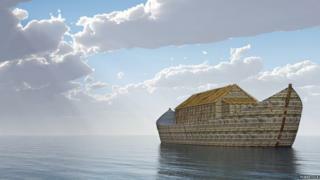 An Independent Irish parliamentarian has used the biblical story of Noah's Ark to support his views on climate change. Earlier this year, Danny Healy-Rae denied there was a human impact on climate change. He told the Dáil (Irish parliament) "God above" controlled the weather. In an interview for Hot Press magazine he said "facts" such as the Ice Age and Noah's Ark supported his views. In the Old Testament's Book of Genesis, Noah receives an apocalyptic warning from God about a massive flood, and builds a huge wooden boat to save his family and a selection of the world's animals. "I'm basing my views on facts," he said. "The facts are there and history proves it. "We had the Ice Age. We had Noah's Ark. We had all those stories. Mr Healy-Rae, a Kerry TD, added: "There were some centuries when the country was very hot and warm and then there were different centuries with so much rain and cold. So, those are facts." During a debate on the issue in May, Mr Healy-Rae denied the burning of fossil fuel was the main cause of global warming. Scientists believe gases released from industry and agriculture are adding to the climate change. Human activities such as burning fossil fuels like coal, oil and natural gas are increasing the amount of carbon dioxide (CO2), the main greenhouse gas responsible for global warming.